Frontier Madagascar works with volunteers in Nosy Be to conduct marine research, terrestrial research, and community work. Frontier, The Society for Environmental Exploration, has worked with volunteers across the globe for over 25 years to safeguard biodiversity, build sustainable livelihoods, and inspire young and old to make their travel meaningful. In 1989, they were established as a non-profit conservation and development non-governmental organisation (NGO). Frontier has three projects in Madagascar: marine research, terrestrial research, and community work. Projects are led by highly qualified and motivated staff, and strongly rely on volunteers to provide the workforce. Volunteers learn how to identify local species, help conduct surveys, take an active part in lesson planning and teaching, and work together on community awareness initiatives. Conserve the world’s most endangered wildlife and threatened habitats. Build sustainable livelihoods for marginalised and under resourced communities in the world’s poorest countries. Create solutions that are apolitical, forward-thinking, community-driven, and innovative and which take into consideration the long-term needs of low income communities. The Frontier Madagascar Project moved to the island of Nosy Be in 2011 starting with marine research and followed not long after by terrestrial research. 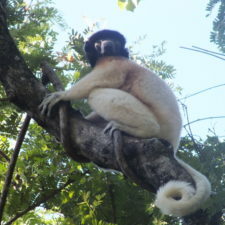 Black Lemur in Nosy Be, photo provided by Frontier Madagascar. Our Terrestrial Research programme has several ongoing projects, all of which contribute to the aim of maintaining a long term monitoring program of indicator species in Nosy Be. This is to determine the effects of human disturbance and habitat degradation. Our research is currently focusing on reptile, bird and lemur species. We are assessing the abundance and diversity of birds and reptiles in different habitat types to determine the effects of human disturbance and habitat degradation. We are also assessing the abundance of the Nosy Be Sportive lemur (Lepilemur trymerlacsonorum), and recently started behavioural ethograms on them to gain a better understanding about the species. We also conduct ethograms on Black lemurs (Eulemur macaco m.) to compare their behaviours across different habitat types where there are different levels of human interaction. Apart from the on-going research led by staff members, interns and volunteers can work with staff to conduct their own mini-research projects. Further to our field research we train local tour guides and give diverse environmental lectures to agricultural students and youth clubs. 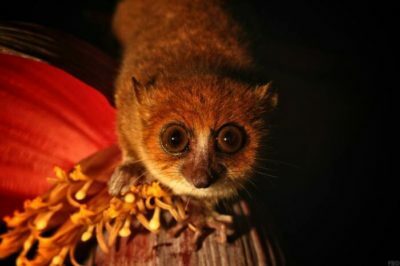 Nosy Be Sportive Lemur in Nosy Be, photo provided by Frontier Madagascar. The Frontier Madagascar Terrestrial Research programme is situated in the village of Ambalahonko, Nosy Be, bordering Lokobe National Park. Ambalahonko is one of a number of small isolated rural villages in the area which are inaccessible by road and usually reached by boat. From there, terrestrial researchers conduct surveys in twelve research sites that were selected along a gradient of human disturbance, based on the time since they were last cleared and their current land usage. The sites range from primary forest that has experienced very little clearing and has low levels of anthropogenic disruption, to those that are cleared annually for agricultural purposes and are crisscrossed by inter-village paths created by the local residents. The primary survey sites are towards the west, near the Lokobe National Park, whilst the most disturbed sites are those nearest Ambalahonko and the nearby Ampasipohy. The outcomes of our research can be found in our Science Reports which we publish 4 times a year. Each quarter we do a full analysis of the data collected. The effects of human disturbance and habitat degradation are noticeable on all aspects of the ecosystem. Specialist species are rarely seen or only in specific locations, while generalist species are found in great abundance everywhere. Shrinking and overpopulated habitats make some species try to survive in degraded and non-diverse locations. 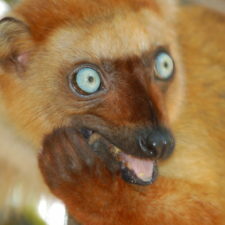 Lemurs become more habituated in areas where they have to share habitat with humans in close proximity. That can raise several issues: they can become an easy target for capture or can cause problems in plantations by becoming unwanted visitors, for example. Since the project was established, Frontier Madagascar has collected a vast amount of data in an area of Madagascar where previously conducted research is extremely minimal. 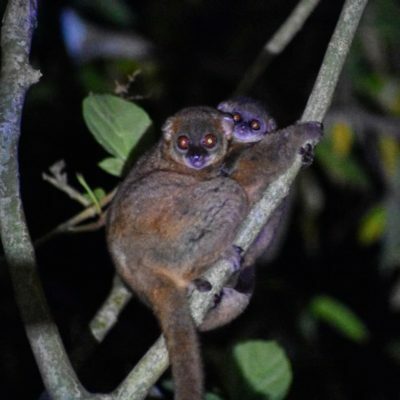 A recent volunteer’s behavioural study of the newly described Claire’s Mouse Lemur, endemic to Nosy Be, documents previously unrecorded and unknown behaviours. Frontier Madagascar’s Terrestrial Research programme focuses not only on research but also on education. Recently, Terrestrial Research staff and volunteers ran a series of lectures for current and aspiring local tour guides on sustainable, environmentally friendly guiding. The majority of students went on to achieve very highly in the closing exam and were awarded with certificates for their achievement which will support them in their career going forward. The Frontier Madagascar Terrestrial Research programme recently collaborated with local young people to run an awareness-raising stall in the busy town of Hell-Ville, Nosy Be about lemurs and pet lemurs in Madagascar. 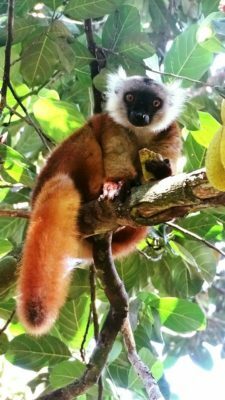 With animal welfare generally a low priority in Madagascar, this was extremely successful in engaging local residents in thinking about treatment of animals as well as the importance of the local lemur species. The Terrestrial Research programme is dedicated to working with and alongside its neighboring communities. Presidents of all local villages are fully informed and in full agreement with all research that is being conducted. Frontier Madagascar and local communities are collaborating to ensure an exchange of knowledge and cross-cultural understanding of local environmental issues. 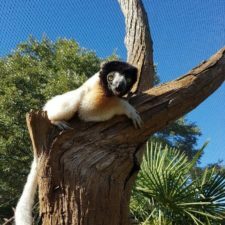 Through Frontier Madagascar’s educational programme, local residents are increasingly aware of the importance of preservation of the forest and lemurs for the sake of the environment as well as the tourism through which most local villages make a proportion of their income. 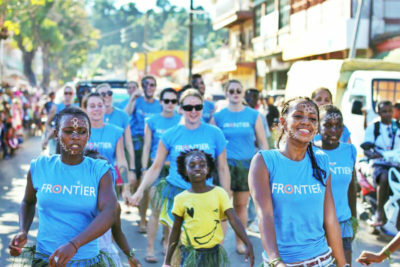 Frontier Madagascar hopes to leave a legacy of understanding and raised awareness of the importance of the environment and sustainability in the area, which will be passed down through generations to come and continue to impact upon local behaviours. 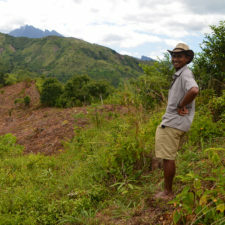 The Frontier Madagascar Terrestrial Research programme is funded entirely by the volunteers that engage in the project. The fees that they pay feed directly back into the work that we do. We do not accept donations. If you want to support the work of Frontier Madagascar, volunteer with us in Nosy Be!